I got to host my sister’s bridal shower a few years back, and now her baby shower too. 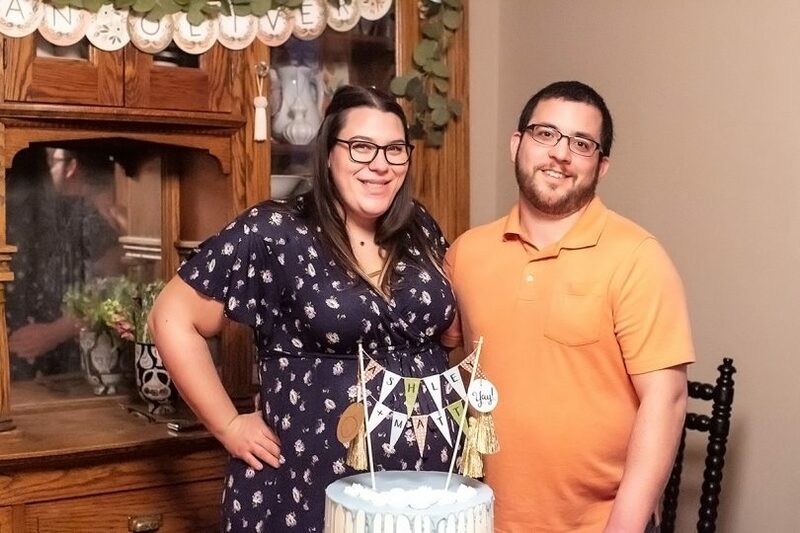 Ashley and her husband Matt are going to be parents! A huge thank you to both my mom and Matt’s, my co-hosts. We had even more people at this shower, but we did it! Everyone fit and a lovely time was had by all. 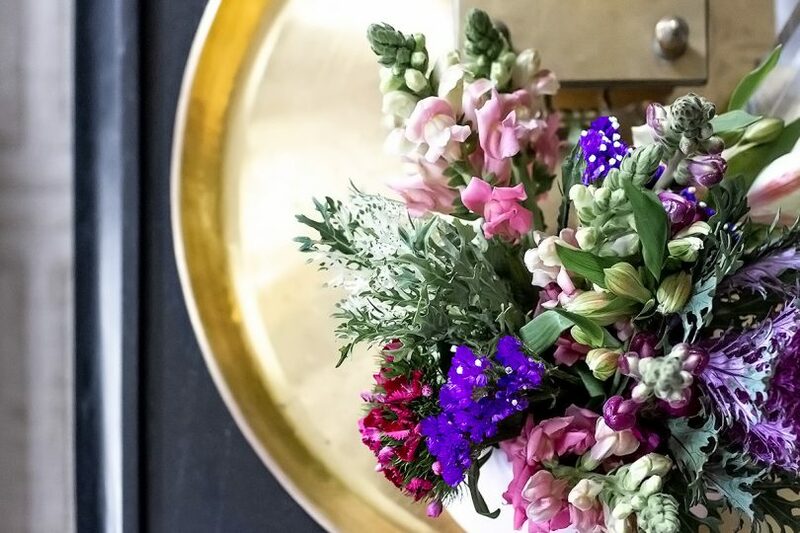 I’ve done enough entertaining (and enough photoshoots) over the years to have most of what we needed on hand — we just had to add food, drinks, and flowers. My baby shower was at my sister-in-law’s house (I love big parties in someone’s home), and I was so charmed by the onesies hung up on a clothesline that I wanted to do my own take on it. 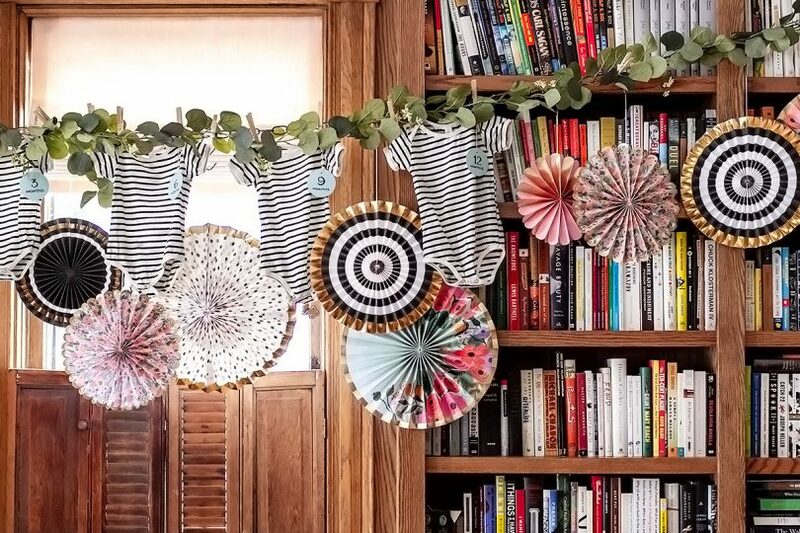 I strung up paper party fans in various colors and patterns, then hung the striped onesies from Calvin’s monthly photos. I made a little tag for each (0 months, 3 months, etc. ), and also crafted a cake topper similar to this one from years back. I also drew the little baby illustration that I used to sell in my stationery shop! 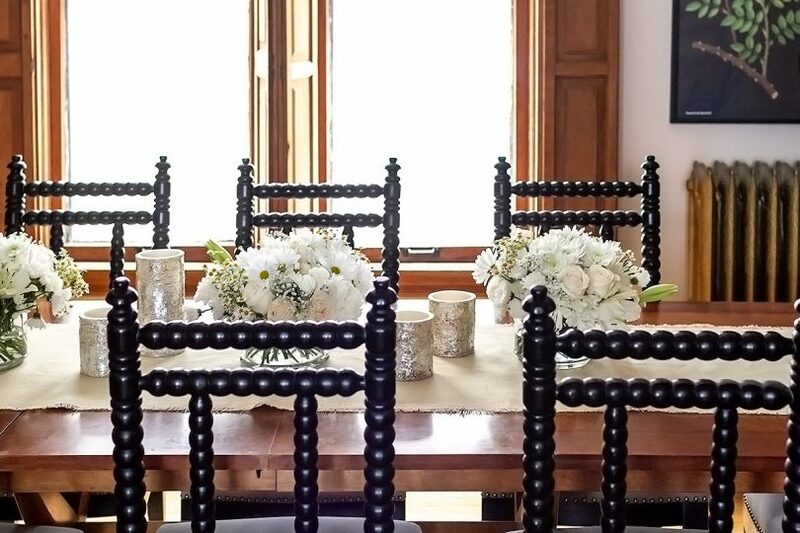 The bunting was strung with butcher’s twine and bamboo skewers, plus the cutest paper tassels for added sparkle and dimension. Sugar Fixé made perhaps the best cake I’ve ever had. 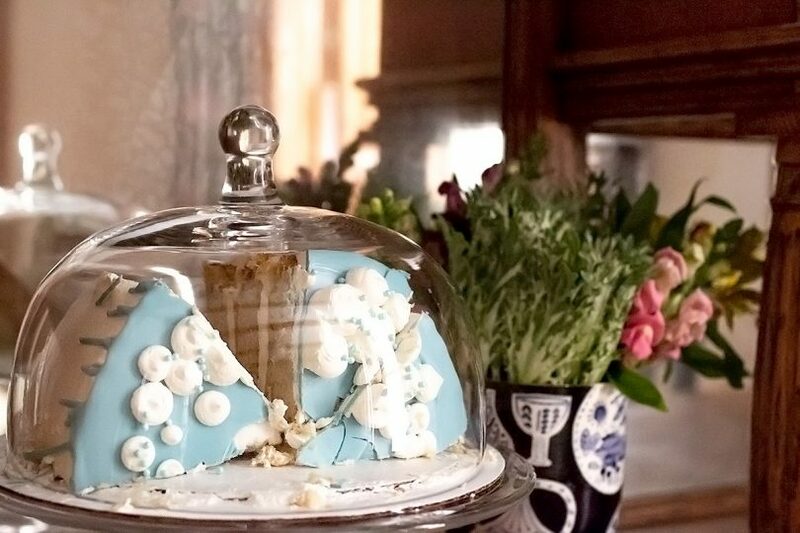 I’m not normally a huge cake fan (I love sweets, but not when they’re overly sugary), and theirs was lovely, on the sweetness scale more towards a scone. Am I describing it well? A food blogger, I am not, but it was delicious, and so pretty. 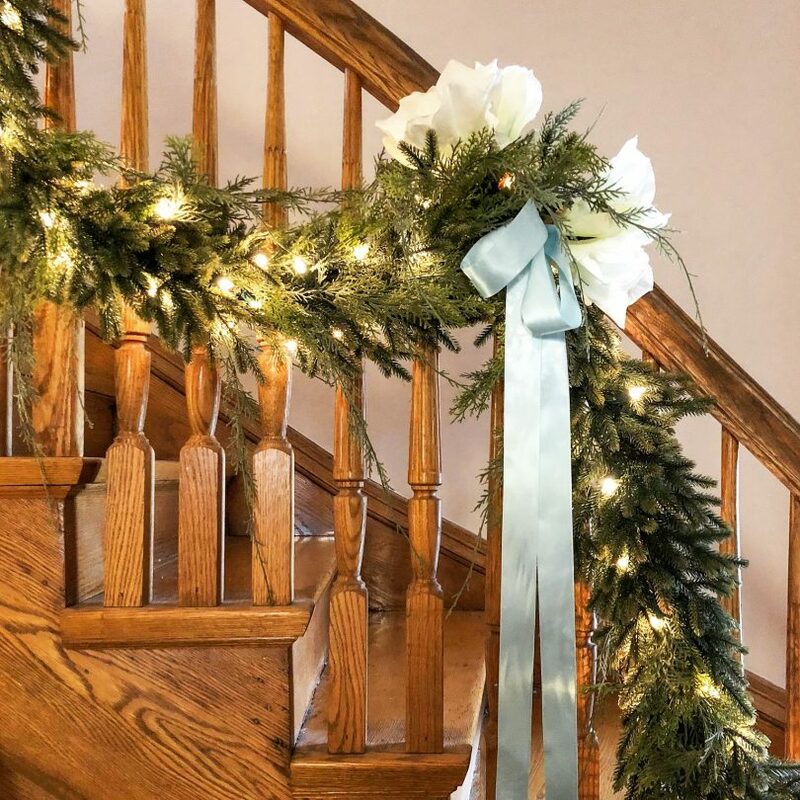 We were only a couple of weeks out from Christmas, so the garland on the stairs stayed (as did the outdoor lights and garland). I tried to take it into “baby shower” territory with the addition of ribbon and flowers, and the added sparkle was nice. 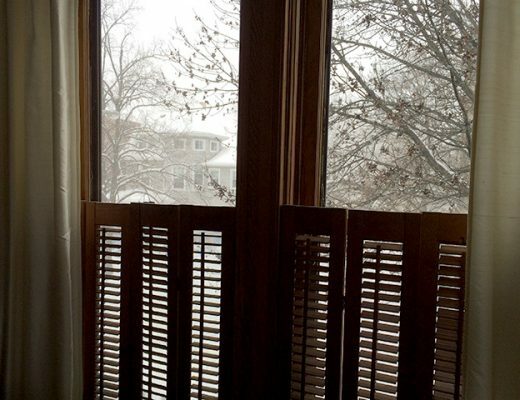 I think I’ll be doing the same thing when it comes time to decorate for the holidays next year! 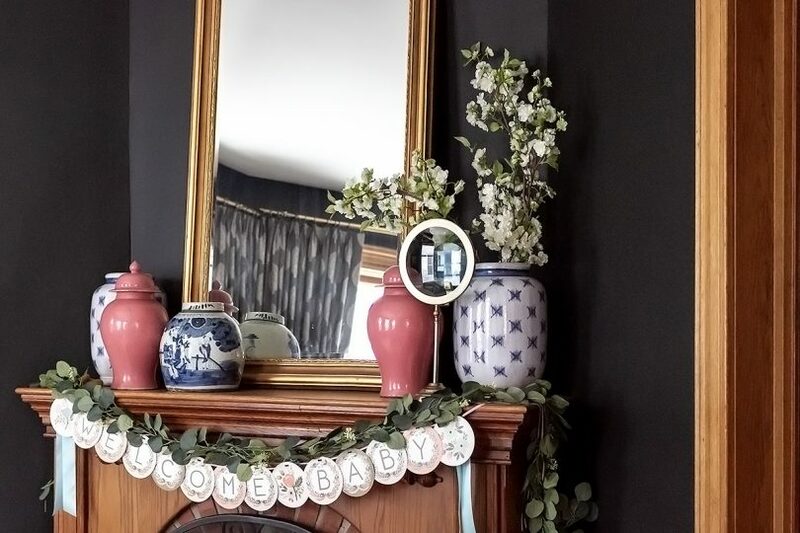 The Christmas decoration came down everywhere else, and the fireplace is back to its everyday look with ginger jars and oversized vases. (If you are curious about sources, everything is always listed here.) 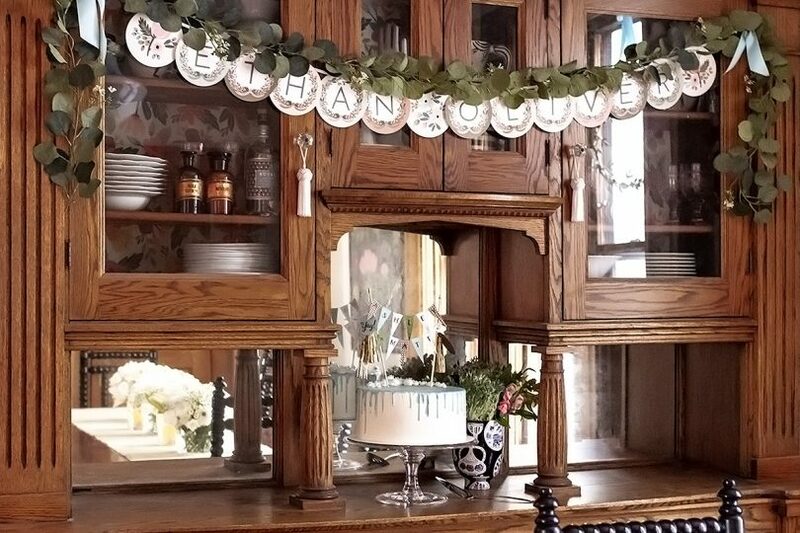 I had enough letters in my banner kit to not only spell the baby’s name across the dining room sideboard, but also to add “welcome baby” across the mantel. 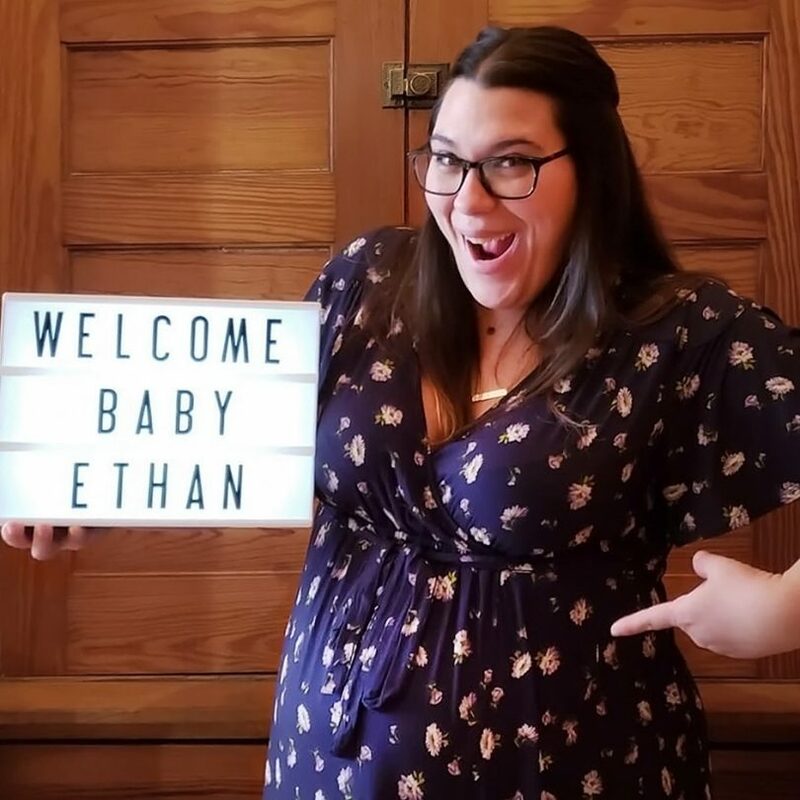 Yay for my Ashley and Matt, and we can’t wait to meet you, baby Ethan! 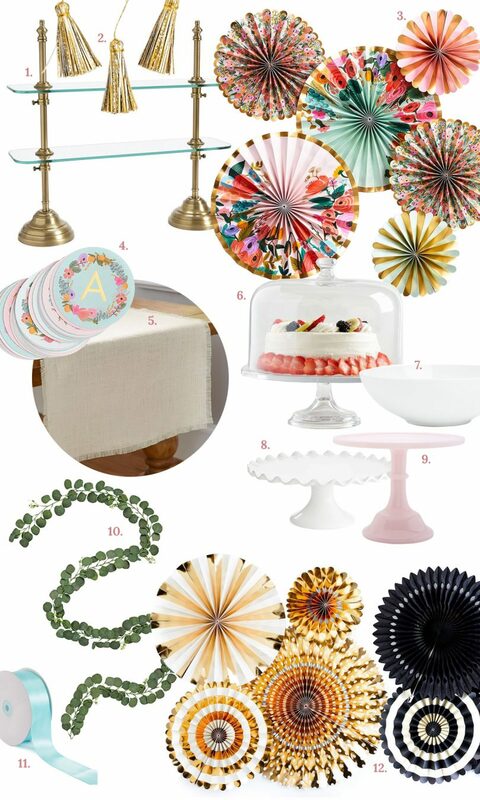 A few cake stands in differing sizes, a tiered serving tray, and paper fans in a variety of colors go a long way. You’ve seen these here before, and you’ll see them again in the future. 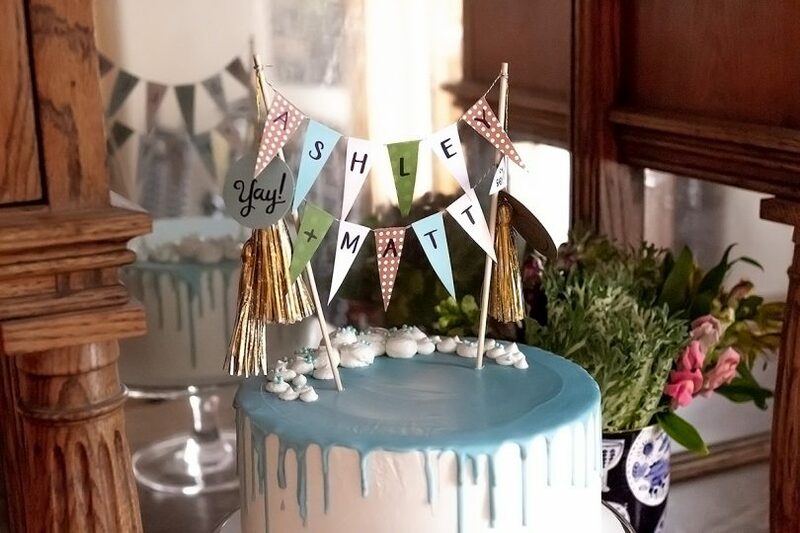 The essentials below can be mixed and remixed to fit all kinds of schemes from kids’ birthday parties to a New Year’s celebration, to (of course) a bridal or baby shower! Oh boy- babies babies babies! I joined you Nicole when you were carrying Elinor and not having any grands I stayed with your blog as much for the fun of the children as the decorating although your talent as a decorator-from the more modest home to what shows as a mansion with everything just stunning in the choices you make and your artistry. Congrats to your sis and the new daddy and a wonderful 2019 to you all. P.S. I wonder if your children know how many people think they are darling and semi famous! 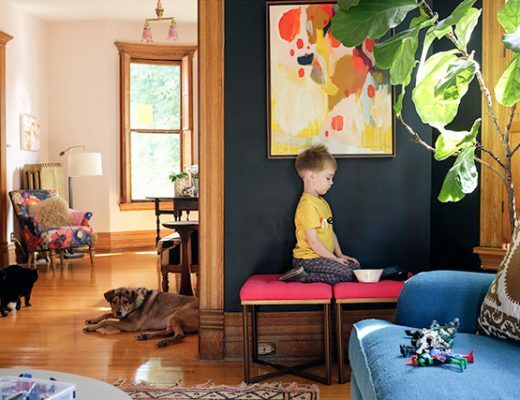 It’s all so lovely – you have such a great eye for design! Thanks for sharing! Beautiful shower! You really make special occasions and entertaining at home lovely. Hope your sister has a beautiful birth too.